Wildlife Trails- A trip to the Keoladeo National Park, Bharatpur - Ghumakkar - Inspiring travel experiences. A long awaited weekend paved the way to exploring a whole new destination and this time around it was a wildlife expedition. We, my family, drove from Delhi to the nearest wildlife sanctuary, “The Keoladeo Ghana National Park” or more popularly known as “The Bharatpur Bird Sanctuary”. The route involved a drive through the NH2 till Mathura and then a right turn to SH33 that connects Uttar Pradesh to Rajasthan, Bharatpur. A drive of about 230 kms, route map courtesy Google maps, we reached Bharatpur in about four hours. A welcome relief from the concrete jungles of city life the gates of the sanctuary open to a lush green forest. Narrow yet well maintained road that transverse the sanctuary lead to The Hotel Ashok- our refuge for next two days. 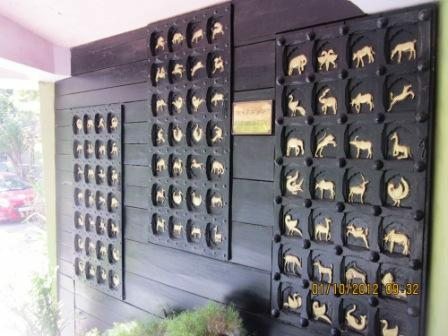 The lodge is touted as the only hotel within the sanctuary premises and that in itself sounded so enticing and adventurous that we booked it in advance on a travel site. No sooner did we check into the hotel we had a brief lunch. Usually the hotel is booked all through the “season period”, which means the sanctuary is host to thousands of migratory birds and resident animals, September mid to March. The story goes how the kings together with the then ruling British viceroys hunted birds for avocation. 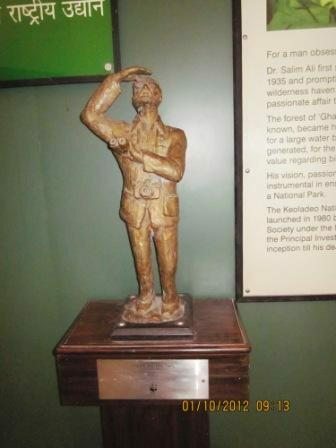 On one such occasion around 4500 birds were killed in a single day, nature conservationist Salim Ali was so appalled by the massacre that he literally pleaded and coaxed the king to turn the forest into a bird sanctuary so that these beautiful creatures could be studied and preserved for the future generations. Thus started the journey of the sanctuary, which changed many names and finally came to be known as “The Keoladeo National Park” on the name of the residing Keoladeo Shivling which quite miraculously emerged from the inner depths of earth when the tree standing above it was cut down. It is said that this is one of the “sayambhu shivlings” and thus is revered by Hindu devotees who flock to the temple in hordes during shivratri. 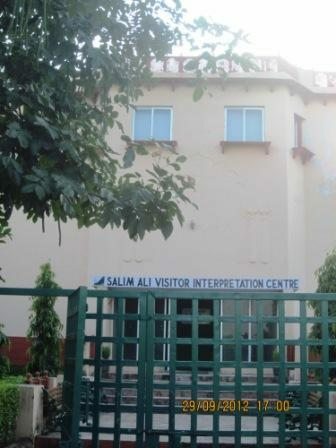 Although my review of the hotel is not very good and nothing like “living up to the hype”, one could manage staying there since the main attractions are the peacocks, deers and jackal sightings around the restaurant during night time together with the boisterous cacophony of the ecstatic birds through the day. Imagine how exciting could it be living that close to animals we only witness on wildlife channels and breathing the fresh intoxicating cool breeze in a moonlit night. An early morning visit to the inner section of the park is a delight. One could hire cycles to ride by themselves or rickshaws where the rickshaw pullers double as guides too; however, trained guides are also available. It is a wonderful experience meandering through the narrow lanes sighting thousands of varieties of birds ranging in sizes from few inches to about two feet! The plumage is so breathtaking one could find nature at its best this time of the year, it is said when the berry trees are ripe with fruits the forest floors look completely stunning. Scanning the forest canopy from the by-lanes requires well trained eyes, a good guide book or a guide and a binocular to sight the majestic birds such as herons, egrets, spoonbills, storks and ibis that flock to the breeding site from across the world spanning distances across thousands of kilometers from Russia, China, Srilanka, Europe and Tibet. Its indeed a visual treat to catch the snake heads dry their wings before planning the next dive into the water, birds sitting patiently while catching fishes and listening to the male and female Saras crane’s symphonic calls hidden deep in the trees. It is said that a Saras crane pair live and die together, so much for the mindboggling loyalty amongst creatures we feel are inferior to us! 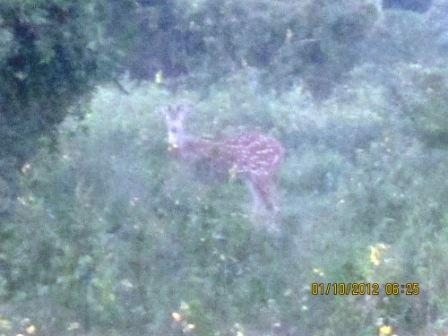 Various deers can be seen peering through the dense bushes looking at humans with equal curiosity. The most difficult ofcourse is taking snaps of the deers who are so swift that the moment one tries to click, the deer is far gone! Jackals sitting leisurely on the winding lanes completely unaware of human presence get stunned by humans and flee to the nearest hideout amongst the bushes before one could even realize its proximity. 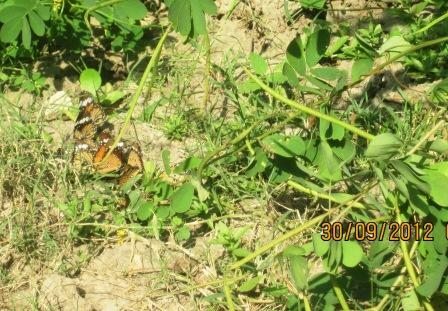 Other resident animals include the turtles, boars, hyenas, cows etc. The main mantra though is ofcourse maintaining silence and making the least noise while walking so that the animals don’t get intimidated which is equally advantageous for the visitor too in capturing birds and animals in their natural habitat coursing through their routine chores. 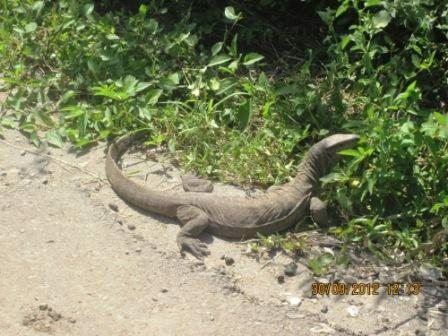 Other exciting sightings were that of the monitor lizards we often see on television lazily basking in the sun, chirpy squirrels following the rickshaws trails, confident monkeys transverse through their daily routes in search of food and the exhilarating butterflies in scores flying by. There are certain stretches where one can travel on foot to sight birds, insects, fishes and even plants to their hearts content. Although we could not see one but pythons stuffed with their heavy meals are a common sight. 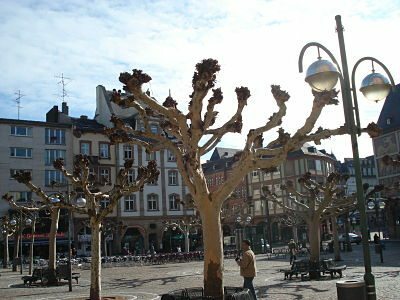 Locals have many interesting anecdotes and stories to share if one has a patient ear! All in all the entire visit may take hours together to complete, since the rickshaw pullers have a per hour rate, they can continue with their stories and trails until the visitor is tired or hungry. There are a couple of watch towers across the stretch of the park for observers while for devotees there is the venerated Shiva temple -the Keoladeo mandir which is thronged by many during shivratri. The day although very tiring, was still worth every drop of sweat. One could even be lucky enough to buy books and souvenirs, if the staff is not on leave at the book store located in the museum complex just besides the hotel. A walk through the museum could enlighten one on the founder’s contribution to the preservation of this sanctuary and making it available to the modern day nature lovers. The day ended with a much needed good food at the hotel restaurant and the mesmerizing animal calls in the captivating moonlit night against the silhouetted peacock frames across the tree tops. 1) Ganga Mandir: The temple was built by Maharaja Balwant Singh in 1845 and is a typical example of the unique Rajasthani architecture with its exemplary facade vying for all the attention. 2) Laxman Mandir: Dedicated to the local deity Laxman, the younger brother of Lord Ram this temple is known for its intricate architectural work. 3) Lohagarh Fort: This fort is made of iron and was constructed by the Maharaja Suraj Mal. The fort stands erect and takes pride in the fact that it could not be invaded by either the Mughals or Britishers. The architecture of the fort involves the famous Asthadhatu gateway or eight metal gate. Hi, a very nice review of the sanctuary. I have a mixed experience of the park. My first visit on 25th Decemeber, 2003 was an wonderful experience. There was a big lake at the end of the park with full of water and many many birds…and water was everywhere, so as birds. But, we were so sad to see that the lake and entire park became an arid wasteland during our next visit on 23 January 2005, within just one year. We hardly seen any birds except a few. Once a haven for migratory birds, it wears a deserted look. Shortage of water was one of the prime reasons for the decline in the number of migratory birds visiting the park. We have never visited the park after that and have no idea whether the situation improves today or not. Has it been changed now? Do let us know. We may go there in winter and plan to hire a bicycle to see the entire park. The situation is much different now, actually due to heavy rains, the nearby dams had let more water into the sanctuary, the locals indicate the water would recede by October and more animals would be visible than they are now. The park is beautiful in the winter months and i guess you should make it a point to visit the sanctuary then, you will surely carry some spectacular memories. 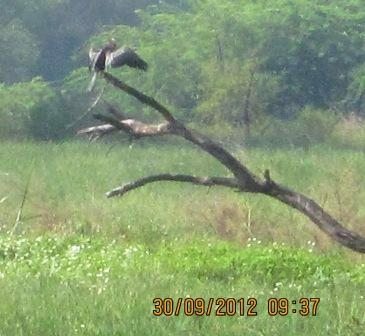 I have wonderful memories of Bharatpur Sanctuary. We were a group of office colleagues and had rented bicycles to get around. It was fun running after the nilgais and deers for that photo! Will go back during the window when the water recedes and before it becomes arid wasteland! Yeah bicycles are fun too, many people were riding cycles and seemed really happy, since we were family we decided to take rickshaws instead. The water has started receding now, by october mid or end many migratory birds are expected to visit the sanctuary. Good luck for your trip and hope you get to click the shy residents. 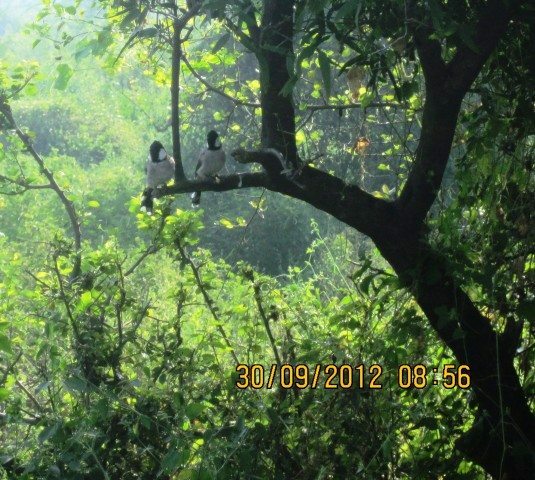 Such a wonderful & Informative post along with captured of Bird Sanctuary pictures. Seems, some pictures aren’t clear. I am from Agra City. Just about 60Km Away from my Place but I couldn’t see this wonderful Ghana Bird Sanctuary. After reading your post, this sanctuary have been set in my mind and soon will go there. Thanks for sharing beautiful logs. 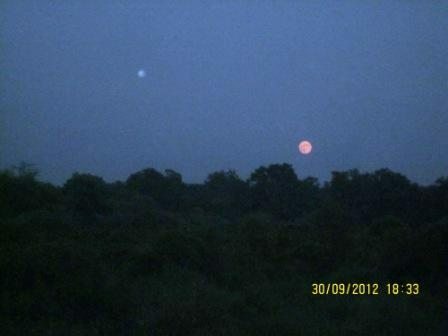 Some snaps have been clicked in dark or late evening and thus have not come very clear. However, i tried to put snaps so that whosoever reads the post is enticed enough to visit the sanctuary. We had a wonderful time in the midst of nature and you should surely visit the place since you stay so near that you don’t even have to plan your visit! Wish you have a great time too. Long time Mala. Glad to see this chirrupy story from you. Been there only once and thought that I would come here more often. From Noida/Gzb side, now the place can be reached under 3 hours because of ‘Yamuna Expressway’. Thank you for re-igniting the desire and a very well written complete log. Yes indeed after a long time. Thanks for the appreciation. Will try out the expressway route sometime, but for now we took the NH2 since that was closest from our residence. I have heard a lot about the expressway though. 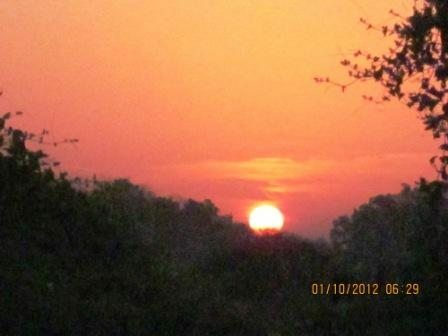 Hi Mala, thanks for this beautiful travelogue on the Bharatpur sanctuary. From the date stamps, it is clear that you have written this blog in record time, within days of visiting this place. Your description of the ambience is very evocative and it was a very enjoyable read. I know, from personal experience, how difficult it is for amateurs to photograph these elusive creatures. Waiting for the perfect shot detracts from enjoyment of seeing these creatures in the wild, in their natural environs. I wonder what your feelings were when you were in close proximity to a monitor lizard. I have just one complaint; there were no captions for the photographs. Yes it is a current blog since the memories remain freshest then:), I usually make it a point to write down my memories as soon as i come back from my holiday destination. The experiences were amazing, the view of the monitor lizard was more adventurous than intimidating since i was not the intended prey:). However clicking them was indeed a task and what i regret most is of not being able to click the agile jackal! I have taken a note of your complain and will remember to incorporate the same in my next article. Long time…. Enjoyed the article. We visited Bharatpur about two years back – cycles were out of circulation then (some management problem, we got to know). So our trip was on Rickshaw, with an affable Raju guide. Beautiful pictures and Nice post. Thanks for the appreciation Vishal. A lovely story crafted around birding! There are very few stories on birding here. Today evening, while taking kids to the park, we spotted a Shikra which was sitting on a branch at our eye level and just 4-5 ft away from us. We were taken aback and it remained seated nonchalantly! Birding always throws up surprises and all the experiences are unique. Indeed true, watching birds carrying out their routine chores is engulfing, one can completely get lost in observing these beautiful creatures. Thank you for the appreciation Abhishek. I have been there few years back on a family trip. It is such a beautiful place, you can enjoy the silence there. Thanks for reviving the memories. Images size could be increased a little for better effect. The anomaly here is that one could love the silence as much as the noise created by these bird colonies! But the one truth remains that Bharatpur is beautiful and it was a wonderful experience visiting the sanctuary. I would like to visit Kausani; Binsar; Ranikhet; Mukteshwar; Auli; Jhaltola in a single trip. Is it advisable to go in the month of December or January which witness snowfall as I feel it may spoil the vacation in terms of not able to see clear views or blocked roads. Also, kindly suggest mode of transportation other than cab. I think local buses may not have good frequency as we will be two adults and one child. Also. are there any excursion options from Jhaltola. 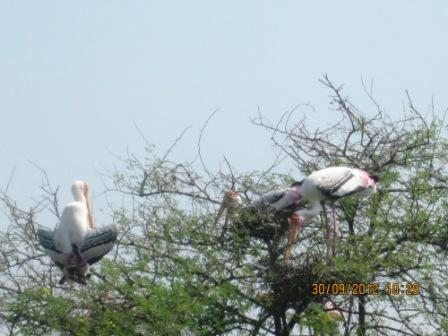 Keoladeo is indeed a wonderful place to see birds in their natural habitat. Because of its cultural values this park has been included in the list of World Heritage Sites list. This post is amazing, it is like taking a small trip to the park. Nice work really. 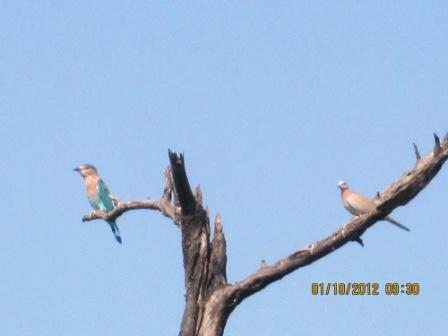 My wife asked me to plan a trip to Bharatpur due to long weekend 25, 26th & 27th Jan 2013. Ghumakkar is a very informative site. As usual before taking any trip I take the help of Blogs written by individuals in Gumakkar and I came across to your blog. I came back from the trip and found your information although written long back but still valid and very useful. We started around 10:30 in the morning. from Delhi NH-2. We faced little road jam problem in Faridabad otherwise Journey was OK and NH-2 is good for Max speed of 80 KMPH in day time. Near Palwal Traffic Police was scanning all the vehicles for high speed. So be careful. In Mathura we took halt and had our launch in Highway Plaza. A good place for food both Piza Hut and Indian Restarurant Royal Treat are available there. We again took NH-2 and after 700m we found Railway Bridge. Just after the railway bridge there is a turn to right hand side for Bharatpur, In fact you have to go little forward and then take a U Turn, as no opening is available in the center verge. This road is also good except few speed breakers in the villages. In the evening last entry is allowed at 4:30, so we decided to visit in the morning. It is advisable to take Rickshaw from the Main Gate itself. There are 125 cycle rickshaws only, so not sufficient to meet weekend demands. By walk it is really difficult to go up to the temple and come back. However we did. We started around 7 A.M. and first we went to Ashok Hotel for Breakfast. They charge Rs 180/- per person for buffet breakfast. 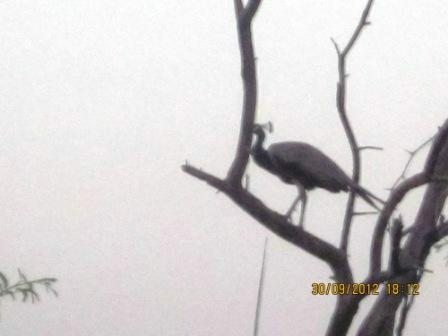 There are real nice birds near the temple area, migrated from South and Assam for breading. Every year Pelican migrate from Assam side. As there is lot of water this time they migrated in good numbers. One should not miss them. Very beautiful to watch. 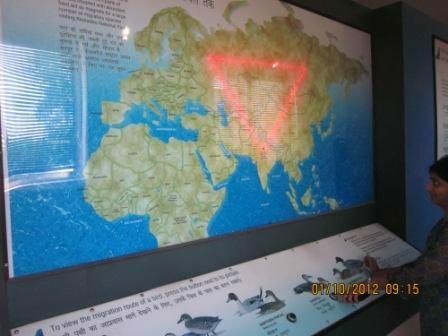 Above birds migrated from South for breeding. 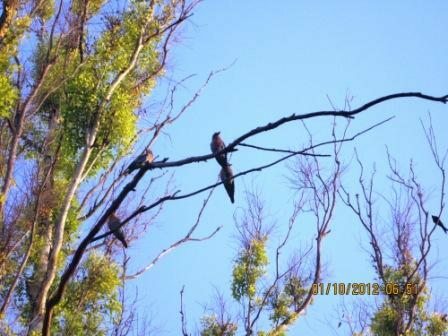 Look at their nests on the tree. Neel Gaye. 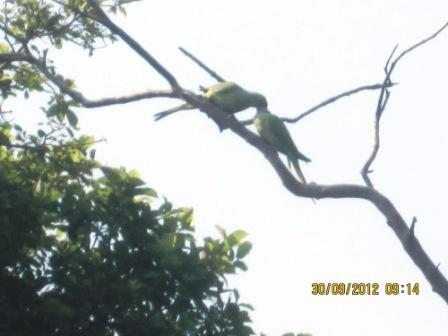 They do pottey at same place everyday.